Fiction – paperback; Allen & Unwin UK; 307 pages; 2014. Review copy courtesy of the publisher. 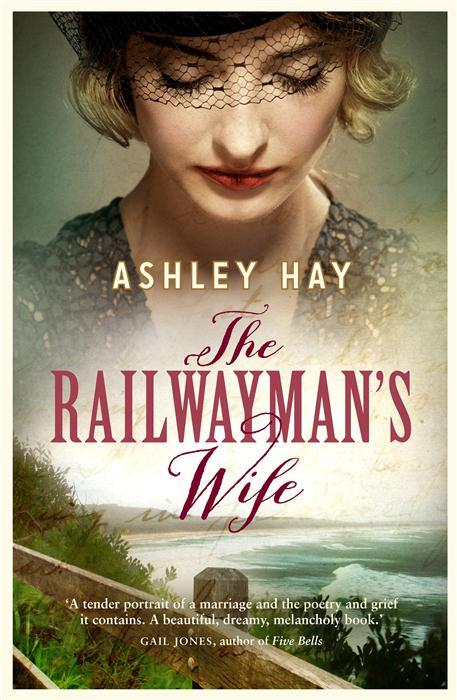 Australian author Ashley Hay’s second novel, The Railwayman’s Wife, is a gentle, elegiac read about universal themes — love and loss, marriage and grief, memory and forgetting — in the aftermath of the Second World War. Set on the NSW coast at Thirroul in 1948, the book focuses on three main characters, all of them damaged in some way: Annika Lachlan, the railwayman’s wife of the title, who is widowed early on in the novel and now faces the prospect of raising her 10-year-old daughter alone; Roy McKinnon, a poet who is shell-shocked by the war and no longer able to find solace in words; and Frank Draper, a doctor, who was present at the liberation of one of the Nazi concentration camps and is plagued by guilt because he could not save those he found. The story spans a year in the life of these characters as they set about adjusting to changed circumstances. But the novel’s main focus is on Annika, who must face two new challenges: coming to terms with the loss of her husband, Mac, and going to work for the first time. Her job, however, is one from which dreams are made: she becomes the sole librarian at the Railway Institute. She thumbs at the ledgers then, the card files, the neat stacks of paper ranged in the neat wooden trays — a strange topography for her to learn; where things are recorded, how things are traced. She glances at the names of the library’s borrowers, names from church, from Isabel’s school, from conversations in the street. The lady who owns the dress shop has been borrowing Penguin classics. Mrs Padman, Mrs Bower, Mrs Floyd — their husbands all crossed out of the register; probably Mac has been crossed out like that now too. The two owners of the rival shoe shops had both requested a manual of railway signs — how peculiar is that? Her fingers flick towards L for Lachlan: Ani, Isabel — and Mac. And there it is, the list of every book he’s ever borrowed, the line now through his name, the terrible sense of a thing reckoned complete and unalterable. The Railwayman’s Wife is one of those dreamy, languid books that slips down as easy as hot chocolate. Nothing remarkable happens in it — there’s no real plot other than following Ani’s life for a year — and yet I found myself completely caught up in the story. There’s an aching sense of loss and melancholia throughout, helped in part by Hay’s limpid prose, but also by the way in which Ani’s memories of her courtship and marriage are interleaved (in alternate chapters) with her present day experiences, filling the story with poignant reference points. This is also helped by the men’s reactions — of trying to learn to live again in the shadow of a war they wish to forget — which are pitch perfect. I loved the setting, too — the beauty of the coast, the noise of the railyards — which becomes almost a character in its own right. And the constant literary references — the library Ani works in, the importance of reading to her (and to Mac), the poet struggling to find his voice again — are a treat. There are, in fact, many references to D. H. Lawrence — he actually wrote Kangaroo in Thirroul when living there in 1922 — and W. B. Yeats. Finally, can I just say something about the cover, which is totally ruined by the horrid woman’s head at the top? It makes this book look like genre fiction, which it is not, and I’m sure many people will simply overlook it in a book shop because “it doesn’t look like my sort of thing”. And yet this is a truly lovely, heartfelt book about what it is to be alive in a world that offers hope — if you choose to find it. Funnily enough I just ordered a copy of this this morning (along with Cynan Jones’s ‘The Dig’) and I dithered over it because of that cover… reminds me of buying a copy of William Riviere’s ‘Echoes of War’ (a wonderful novel) in Dillons back in 1997 and pretending I was getting it for my Mum when the bloke at the till looked at me askance! Anyway, good to hear that it is worth a read. I was glad to see that reference to the cover. I just finished reading Patrick McGrath’s Constance, which features a similar cover (could even be the same model) which is equally misleading when it comes to representing the book. Judging books by their covers is fraught isn’t it. Have heard that some readers have enjoyed the freedom of cover less reading on public transport etc when they use a digital device!! I loved this book and agree with everything you say about it. The cover did make me wonder about the contents but you soon forget about it after the first couple of pages. I love the woman’s makeup on the cover. I did see the same pic used on a vampire type novel recently and I lost any joy I had in the cover previously. I have a copy of “The Dig” — have been told it’s a very “male” book, so be interested to hear your take on it once you get around to reading it. The thing is, there’s quite a nice image on the cover already — of the beach — so I don’t know why they had to spoil it by putting a woman’s giant head on top. I think the only thing this does (aside from put readers off) is give some indication of the time period in which it is set. I miss not seeing what people are reading on the tube, now they’re all reading Kindles or watching Sky on their iPads! It wasn’t that long ago you could tell what books were in fashion/popular because every second person would be reading them — Steig Larsson springs to mind. Oh my goodness — the same image? I can see why that might put you off! I agree, this kind of Women’s Weekly cover design did put me off until I heard on the grapevine that it was much more than it appears to be. By chance, I sat next to Ashleys agent at the Barracuda launch dinner (she represents Christos Tsiolkas as well) and she told me that the cover had been hugely successful in getting this novel into almost every supermarket in Australia. So these kinds of covers obviously sell, even if I dont much like them. I bow down to her greater wisdom. Well, I finally got around to reading this – what a lovely, melancholic book, and yes: so much more than the cover implies. I’d love to see this one make the Miles Franklin shortlist – I’d say it is probably my second favourite of the five I’ve read so far, just nudging ahead of Tim Winton. Oh, and you asked about ‘The Dig’: brutal, visceral, not for the faint-hearted, but absolutely gorgeous in its writing, very poetic. Glad you finally got around to reading it, David, and enjoyed it. It is rather melancholic but there’s a nice gentle rhythm to it — it’s never bleak.